Too often people say they agree that small schools are better for students, teachers, and people in the community -- but then they add, "We can't afford them." The Rural Trust believes that the opposite is true -- we can't afford NOT to have smaller schools. 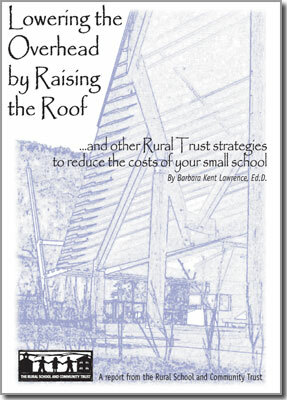 Lowering the Overhead by Raising the Roof provides strategies to help communities reduce the costs of maintaining, building, and renovating small schools, author Barbara Lawrence reports on specific strategies that rural communities have used and shares what she has learned from people throughout the country. The title of the publication comes from a creative solution one rural community used to address their affordable, year-round housing shortage and their difficulties attracting and retaining teachers. The tiny community of Isleford, Cranberry Isle, Maine has a small school located in a structure built in 1913, which had an unused and spacious attic. In 1992, local contractors converted the attic into an apartment, to be offered at a less-than-market rate to help attract a qualified teacher to this isolated community and offer an inducement to remain. The current teacher and his family have been in residence for several years, and the comfortable apartment is a real benefit, making living on the island an attractive choice for them. Lowering the Overhead begins by suggesting factors to consider before starting to plan a school facilities project, such as understanding the resistance to small schools that many administrators and legislators may have, and also understanding the importance of examining and questioning state policies. It may be difficult to change policy that is outmoded, or never made much sense, but it is possible. Lowering the Overhead continues by providing a total of 13 strategies for reducing costs including the importance of good maintenance and siting and using renovation instead of new construction. The book ends with an extensive list of resources for further information on the strategies. The strategies demonstrate that it is possible to afford good small schools by being creative, proactive, and willing to make some compromises.